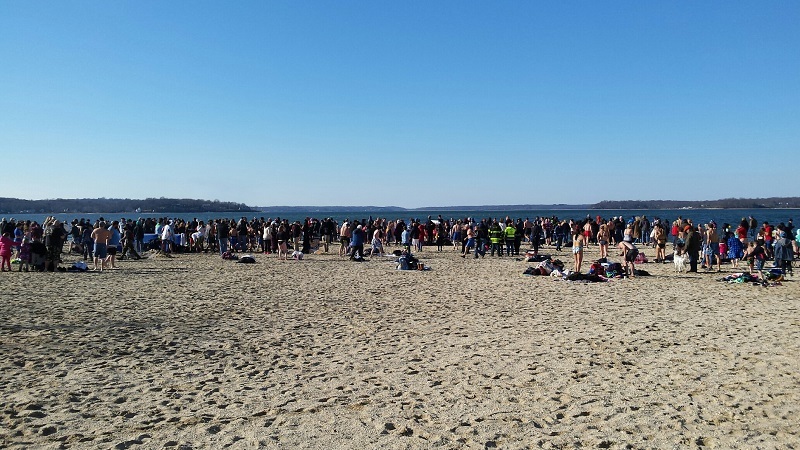 T410 has done it again with another successful Polar Bear Swim Charity Fundraiser. The Troop has raised $4,082 that will be donated to the Northport Ecumenical Food Pantry. This includes 16 corporate t-shirt sponsorships, funds collected by Scouts and on-site donations received today from the 174 registered swimmers and visitors. Additional donations are anticipated. Many thanks to the Scouts and adult volunteers who did a great job on the event. We left Steers Beach in a clean condition, following the Scouting tradition of Leave No Trace. Why did we dive in the water today? The Troop raises funds in support of the national Boy Scouts of America “Scouting for Food” program. The Polar Bear Swim is Part I of our effort. Part II takes place at the annual Pancake Breakfast on March 18. After that, we donate the combined net funds raised to the Food Pantry. T410 was the top fundraiser in the Matinecock District in 2016 – let’s do it again! REMINDER: At the Wednesday 1/4/17 Troop meeting, the Scout who raised the most sponsorship dollars will be awarded a custom Polar Bear t-shirt. If you were unable to get your donations in by today, see Mr. DeSimone at the opening of the meeting.